Luxembourg designer Lis Eich, has shared with us her seating creation named Floora. Designed as her diploma project while studying at the University of Applied Arts in Vienna, Austria, Floora explores ideas from different cultures around the world where they spend time sitting on the ground, something not often done in western culture. 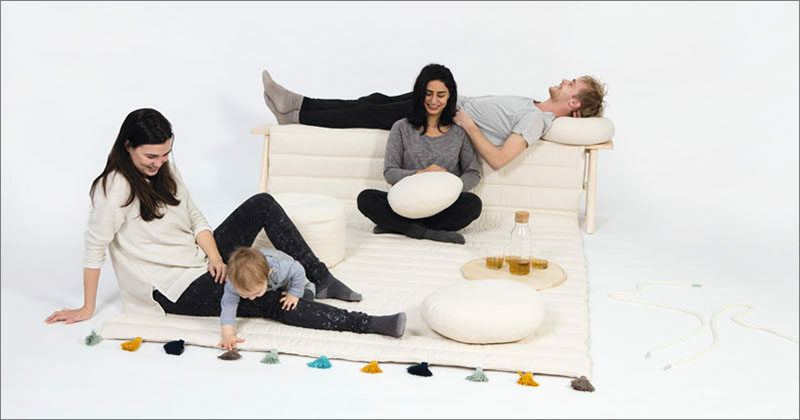 Her aim was to create a comfortable floor-sitting experience that allowed for a variety of relaxing positions, and could be used by multiple people. This was achieved by having a carpet that unrolls from a bench, expand the space that could be used for seating. A variety of cushions and a small table with a removable wood surface can be used to support people as they lounge on the carpet.